Make a large batch of something great, and split it up into gifts for your loved ones. Try these recipes, one spicy and one sweet. It always feels nice to give a gift that’s homemade. You’ve put time, energy and thought into creating something special. But how many people really have time to toil in the kitchen making individually glazed and decorated Christmas cookies? Save your sanity and make something in a large batch, and divvy it up for your various friends. Component post 10228196 could not be found. These two recipes — one sweet, one savory — have become my go-tos. 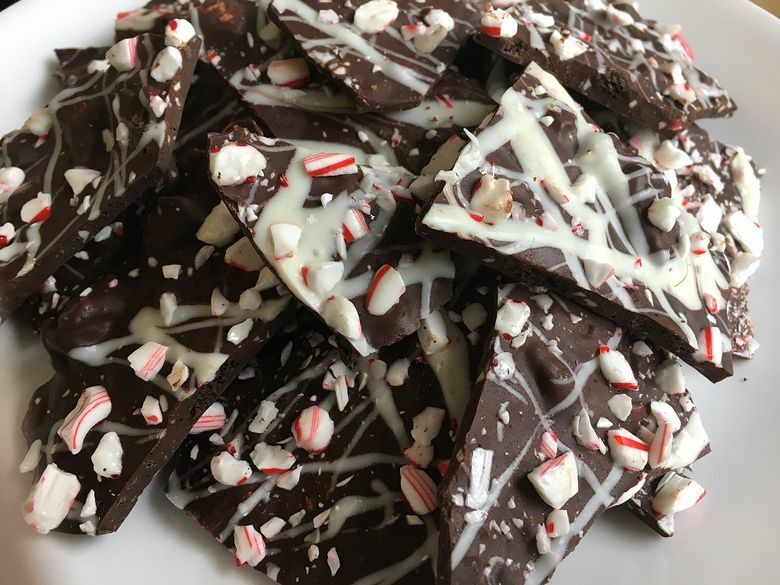 For the sweet, make a bunch of peppermint brittle, break it into pieces, toss it in some of those cute cellophane bags, and you’re good to go. It’s a great way to use those tiny candy canes that seem to multiply like rabbits this time of year. And to release some built-up holiday stress — you get to smash the candy canes with a mallet! On the savory side is the “cowboy candy,” or candied jalapeños. They’re a riff on the spicy jelly you’ve seen served with cream cheese as an appetizer. It’s easy to make, has a nice mix of sweet and spicy, and looks quite pretty, especially when made with a mix of green and red peppers. Be sure to turn on your stove’s fan and open a window, though. The smell of boiling cider vinegar, peppers and turmeric can last in your kitchen for days. Note: To break up the candy canes, I find it easiest to use the tiniest of candy canes, put them in a zip-lock bag, and smash them on a sturdy counter with a mallet. You don’t want to grind them so far that they become dust, just shards. 1. Line a large baking sheet with foil. 2. Stir bittersweet chocolate in a medium metal bowl set over a saucepan of simmering water until melted. 3. Stir in ¾ cup chopped candy and crushed cookies; spread over foil. Sprinkle ¼ cup candy over. Drizzle with melted white chocolate. 4. Chill until set, about 30 minutes. Break into shards. 1. Wearing gloves, remove and discard stems from all of the jalapeño peppers. Slice the peppers into uniform 1/8-¼-inch rounds. Set aside. 2. In a large pot, bring cider vinegar, white sugar, turmeric, celery seed, granulated garlic and cayenne pepper to a boil. Reduce heat and simmer for five minutes. Add the pepper slices and simmer for exactly four minutes. Use a slotted spoon to transfer the peppers, loading into clean, sterile canning jars to within ¼ inch of the top rim of the jar. Turn heat up under the pot with the syrup and bring to a full, rolling boil. Boil hard for six minutes. 3. Use a ladle to pour the boiling syrup into the jars over the jalapeño slices. Insert a cooking chopstick to the bottom of the jar two or three times to release any trapped pockets of air. Adjust the level of the syrup if necessary. Wipe the rims of the jars with a clean, damp, paper towel and fix on new two-piece lids to fingertip tightness. 4. If eating right away, place jars in refrigerator. To can, place jars in a canner and cover with water by 2 inches. Bring the water to a full rolling boil. When it reaches a full rolling boil, set the timer for 10 minutes for half-pints or 15 minutes for pints. When timer goes off, use canning tongs to transfer the jars to a cooling rack. Leave them to cool, undisturbed, for 24 hours. When fully cooled, wipe them with a clean, damp washcloth, then label. 5. 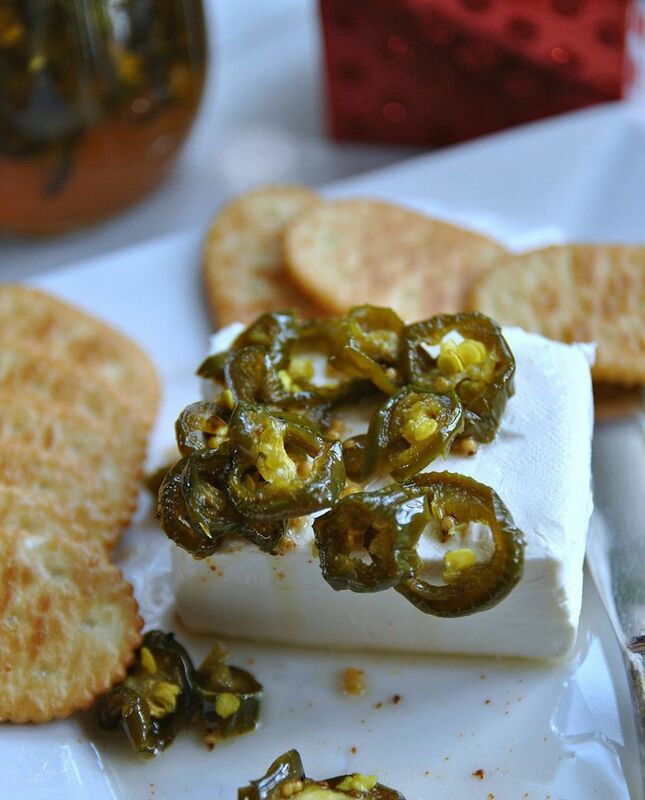 To serve, spoon candied jalapeños on top of cream cheese and serve with crackers.